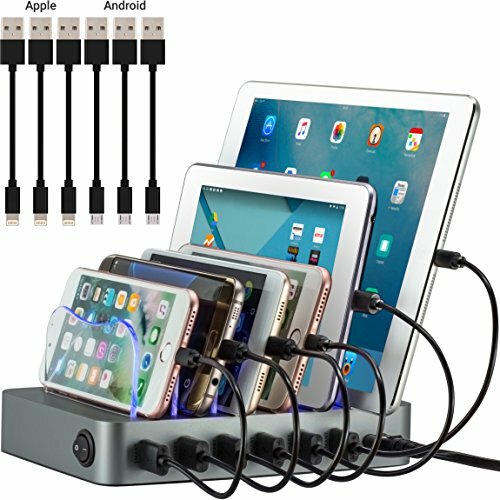 With the Simicore 6-Port USB Charging Station, keep your smartphones, tablets and other devices organized and fully-charged on your desktop. Easy to use, easy to clean. Size: 7.3" x 5.1" x 3.1"
Works with 99.9% of all phones, tablets, power banks, bluetooth speakers and headphones, smart watches, and any device that can be charged via USB. Samsung - All Galaxy and Note models including S9, S9 Plus, S8, S8 Plus, S7, S7 Active, S7 Edge, S6, J3, J7, Note 8, Note 7, Note 10.1, Leader 8, and more. Other Brands - Nokia, Sony, Motorola, Huawei, Microsoft, Windows Phone, BlackBerry, Asus, HP, and many more. If you have any questions about this product by Simicore, contact us by completing and submitting the form below. If you are looking for a specif part number, please include it with your message.